Breast cancer survivors experience diminished health-related quality of life (HRQOL). We report on the influence of tai chi chuan exercise (TCC) on HRQOL and explore associations between changes in HRQOL and biomarkers. 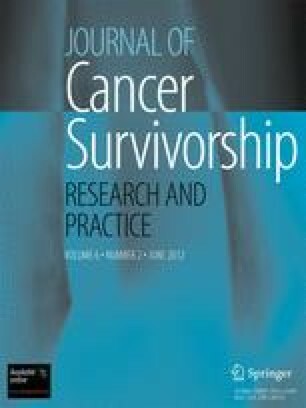 Breast cancer survivors (N = 21) were randomly assigned to TCC or standard support therapy (SST) for 12 weeks (three times/week; 60 min/session). Interleukin-6, interleukin-8 (IL-8), insulin-like growth factor-1 (IGF-1), insulin-like growth factor-binding protein (IBFBP)-1, IGFBP-3, glucose, insulin, and cortisol were measured pre- and postintervention. Overall HRQOL and subdomains were assessed at preintervention (T1), midintervention (T2) and postintervention (T3) and biomarkers at T1 and T3. The TCC group improved in total HRQOL (T1–T2:CS = 8.54, P = 0.045), physical functioning (T1–T2:CS = 1.89, P = 0.030), physical role limitations (T1–T2 CS = 1.55, P = 0.023), social functioning (T1–T3:CS = 1.50, P = 0.020), and general mental health (T1–T2:CS = 2.67, P = 0.014; T1–T3:CS = 2.44, P = 0.019). The SST improved in social functioning (T1–T2:CS = 0.64, P = 0.043) and vitality (T1–T2:CS = 0.90, P = 0.01). There were relationships between changes in IGF-1 and overall HRQOL (r = −0.56; P < 0.05), physical role limitation (r = −0.68; P < 0.05), and social functioning (r = −0.56; P < 0.05). IGFBP-1 changes were associated with physical role limitations changes (r = 0.60; P < 0.05). IGFBP-3 changes were associated with physical functioning changes (r = 0.46; P ≤ 0.05). Cortisol changes were associated with changes in physical role limitations (r = 0.74; P < 0.05) and health perceptions (r = 0.46; P < 0.05). Glucose changes were associated with emotional role limitation changes (r = −0.70; P < 0.001). IL-8 changes were associated with emotional role limitation changes (r = 0.59; P < 0.05). TCC may improve HRQOL by regulating inflammatory responses and other biomarkers associated with side effects from cancer and its treatments. TCC may be an intervention capable of improving HRQOL in breast cancer survivors. The authors thank the Sally Schindel Cone Foundation (KMM), NCI K07CA120025 (KMM), and NCI R25CA10618 (GRM) for the financial support.